Peritoneal mesothelioma is the second most common type of malignant mesothelioma (accounting for an approximate 10% to 20% of all documented cases of the disease) and affects the section of the mesothelium called the peritoneum (the mesothelial lining of the abdomen). Peritoneal mesothelioma is most often caused by the ingestion of carcinogenic asbestos fibers. Inhaled asbestos fibers can become lodged in mucous lining the mouth and esophagus. Once swallowed, it travels through the digestive system where it can potentially become lodged and develop into a tumor. The three cell or subtypes of mesothelioma, epithelial, bi-phasic (mixed) and sarcomatoid, are different not only in their aggressiveness and response to treatment but in their appearance under the microscope as well. Although immunohistochemical staining has improved over the years and it now plays an important role in the diagnosis of mesothelioma, for many scientists, electron microscopy is considered the standard by which mesothelioma is differentiated from other forms of cancer. This is particularly true in the differential diagnosis of epithelial mesothelioma versus adenocarcinoma. Asbestos as a cause of mesothelioma was discovered in connection with occupational exposure to the mineral. Asbestos miners, factory workers, shipyard workers and construction workers were the most likely to contract the deadly disease and amongst the first victims. 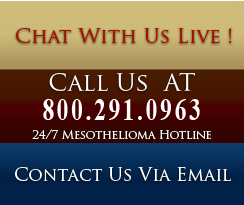 Mesothelioma is a latent disease that can take anywhere from 30 to 40 years to become symptomatic. A number of cases of mesothelioma where therefore reported within similar windows of time, displaying similar occupational backgrounds. Establishing the link back to asbestos (which was already linked to a number of aforementioned diseases) was a relatively simple task. Although other causes of mesothelioma have not been ruled out, asbestos exposure is the only known cause thus far. Mesothelioma diagnosis typically begins with a sufferer's visit to the doctor complaining of chronic chest pain. This pain is caused as a result of a buildup of fluid inside the pleural space; this is called pleural effusion and is the most common presenting symptom of malignant mesothelioma. Preliminary mesothelioma detection can be achieved through a chest imagery scan (CT scan, x-ray); however, mesothelioma is often misdiagnosed as viral pneumonia at this stage because of certain symptomatic similarities between the two. The only way to definitively verify a suspected case of malignant mesothelioma is through a biopsy. A biopsy is a relatively minor procedure (dependent on the location of the tumor) during which a small section of suspect tissue is removed. The removed section is examined by a histopathologist, an expert in the study of diseased tissue. Histopathological examination can confirm a case of malignant mesothelioma while also typing and staging it. Understanding the type and stage can help doctors suggest the best of treatment. Doctors will often use a combination of two or more treatments (chemotherapy or radiotherapy is commonly used to stunt the growth of a malignant tumor prior to a surgical procedure). Asbestos is a mineral that consists of very fine microscopic, needle-shaped fibers. It is composed of silicon, oxygen, hydrogen and other metal ions. Asbestos fibers are strong, flexible, resist heat, acids, and friction and are virtually indestructible. Asbestos has been used in older plastics, paper products and floor tiles. In most cases, asbestos fibers are mixed with a material that binds them together producing asbestos containing material. Many industrial products are made with asbestos materials including sealants, thermal insulation, fireproofing acoustical texture products, textile and cloth products (asbestos gloves, blanket etc. ), Gaskets and packing, Ceiling tiles, wallboard, siding and roofing and more. If you suspect you have been exposed to asbestos, get tested. I highly recommend that you consult with your primary care physician for an x-ray or CT scan referral. It has been estimated that over 30 million people have had asbestos exposure in the past 42 years. There are very small amounts of asbestos in the air we breath every day and most of us have asbestos fibers in our lungs. Construction workers, plumbers, pipe fitters, boilermakers, insulators, refractory workers, shipyard workers and others whose work brings them in contact with asbestos or asbestos containing material, risk occupational exposure by inhaling airborne asbestos fibers. There is also a risk to family members who breath asbestos fibers from the clothes of those workers. Common symptoms of asbestos exposure are shortness of breath, coughing, chest pain, a dry crackling sound in the lungs while inhaling and weight loss. The detectable symptoms of asbestos exposure can appear as early as 15 years after exposure, and the reappear at any time during one's life. This makes it very difficult to associate one with the other and is why annual asbestos detection tests are recommended.